The paradigm of Knowledge-Based Neurocomputing (Cloete et al., 2000b) addresses the encoding, extraction and refinement of symbolic knowledge in a neurocomputing paradigm. Prior symbolic knowledge derived outside of neural networks can be encoded in neural network form, and then further trained. Classification rules of various forms (Cloete, 1996 and 2000) are most often used as prior symbolic knowledge, and then transformed into a neural network that produces the same classification. In the transformation process, one would like to retain the flexibility in the network for further training, and encode the knowledge in such a way that it is not destroyed by further training, but can be revised. In addition, one would like the possibility to improve the classification by discovering new rules if needed. © IEEE. Reprinted, with permission, from Cloete, I., Snyders, S., Yeung, D. S. and Wang, X. (2004). 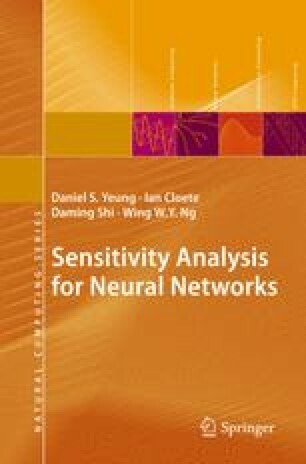 Sensitivity analysis of prior knowledge in knowledge-based neurocomputing. In Proceedings of 2004 International Conference on Machine Learning and Cybernetics, 7:4174–4181.